There’s a good chance you’ll either receive this or buy this is a gift for someone at some point over your whisky voyage, why? Let me tell you. It’s on offer all the time and frankly it’s a good price even when it’s not, it comes in a nice tube and it’s a classically packaged thing and it’s a good whisky, with a decent age statement which people are always blethering on about. 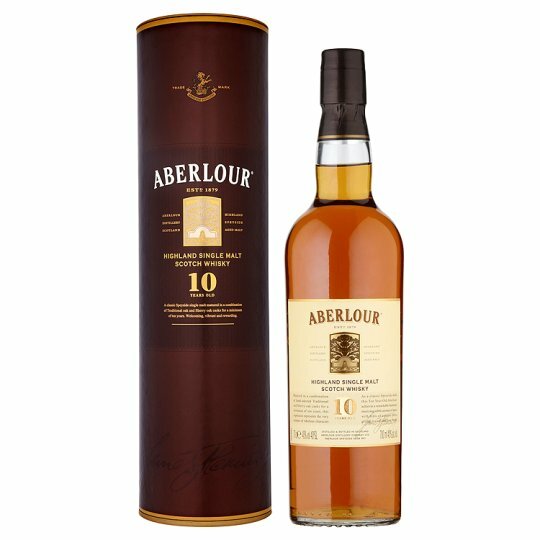 Aberlour 10 is something I own a lot of, I once saw it for twenty pounds a bottle and I had a voucher for money off so I paid eighteen pounds a bottle and bought six, it’s that good and whisky is still increasing price wise so fill your boots whilst you still can. This is fine neat or with a drop of water, it’s bottled at 40% and there is no mention of added colour but I’d guess there is and no mention of chill filtration but I’d say there is too. Nose. Sherry cask richness, plump raisins, rich malt, orange honey, touch of chocolate, rose water, fig and nutmeg. Complex without it being all over place, the nose comes on as it sits in the glass and the water, just a drop, brings out loads but be careful not to drown it. Palate. Sherried fruit again, raisins and apples, quite spicy and a little bit of a burn, more fig and dark chocolate, malty and a touch of oak. Finish. Medium finish, touch of vanilla and cream. You’ll often see this in pubs and I suggest you at least give it a try it’s a nice sipper with just enough complexity to keep you interested.